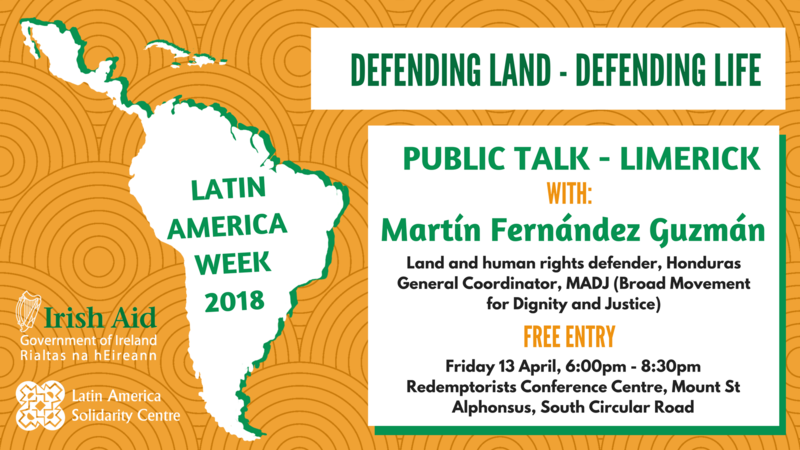 Latin American Week 2018 will come to Limerick on Friday 13th of April with a public talk by Honduran Human Rights and Land defender Martín Fernández Guzmán. Join us in the Redemptorists Conference Centre and have the unique opportunity to hear Martín’s testimony. Coordinator of the Movimiento Amplio por la Dignidad y la Justicia, MADJ (Wide Movement for Dignity and Justice) in Honduras, this remarkable Human Rights and Land Defender will visit Limerick to talk about environmental, land and indigenous rights. Martin will also discuss the recent wave of violent repression in Honduras following the dubious re-election of President Juan Orlando Hernandez in November, and his experiences at the hands of the Honduran state. Born and raised in Honduras, Martín Fernández is a lawyer who fights for environmental, land and indigenous rights. An example of his work is the legal case he is taking against the imposition of a hydroelectric dam project on the Tolupan indigenous people. This construction is causing a huge environmental impact in Honduras, as well as bringing land issues for these indigenous communities. The Movimiento Amplio por la Dignidad y la Justicia, MADJ (Wide Movement for Dignity and Justice) focuses on indigenous and environmental rights. In the midst of the current political situation following the questionable re-election of Hernandez, violence has spiked in Honduras. Like many other activists and citizens, Martín has publicly opposed the current government. As a result, he has been targeted for a campaign of de-legitimisation and intimidation by state forces, which has included death threats and violent actions, requiring him to be 24-hour human rights accompaniment.